Gavin Carlin emerged victorious on Portsmouth Individual League finals night – beating Rob Collins to take the title. 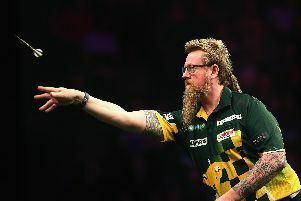 Simon Whitlock claimed the plate crown with victory over Martin Molnar in the final. Andy Jenkins topped the table after the 10-week series, with Bob Crawley second and Steve Harradine third. Jenkins, nicknamed Rocky, also hit the most 180s (44) and shared the highest check-out with Kieron Smith and Richard North (170). Tim Hope notched the fastest leg with a 10-darter. Paul Wolfe scored a 171 as he and Debbie Jones booked their place in the final of the Bishop’s Waltham & District League mixed pairs competition. Their opponents will be Mark Veal and Emma Veal, meanwhile Colole Charrett hit a 105 game-shot. In division four Priory B demolished Black Dog B 7-1 while Acorn SC B enjoyed a 6-2 triumph over Shedfield SC. Wheatsheaf suffered a 5-3 defeat at the hands of Fox & Hounds and Linden Tree B held Acorn SC B to a 4-4 draw. The Farehamania competition returns to Fareham WMC on Saturday (1pm). There is a guaranteed £350 top prize, with plate, ladies, over-50s and early-bird (10am) events on offer. Call 07470 092481 for more details. Waterlooville’s Phoenix Club is holding an open darts competition on Saturday, July 14 (1pm). Doors open at 10am. A blind pairs tournament will be held at 11am.